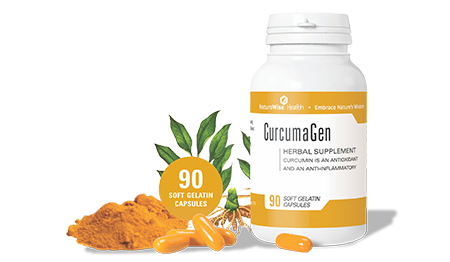 CurcumaGen is a natural, herbal supplement containing a lipidized Curcumin blend. Curcumin has been shown by comprehensive scientific research, to be an effective anti-inflammatory and anti-oxidant with a broad spectrum of health benefits. To address bioavailability, we have used a lipidized co-factor enhanced Curcuminoid (C3) Complex formulation. Inflammatory conditions including, Arthritis, Acne, Eczema/Psoriasis, Joint Pain/Tennis Elbow/Lower Back Pain. In combination with Xeloda, a chemotherapy agent, to significantly improve the outcomes of an elderly Stage T4 colorectal patient. Improving symptoms for individuals suffering from Motor Neuron Disease (ALS) and Multiple Sclerosis. 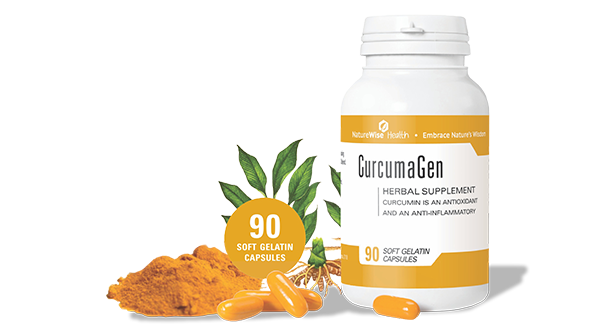 CurcumaGen is contract manufactured for NatureWise Health by PharmaNatura as a softgel capsule according to Good Manufacturing Practices (GMP). This ensures the highest standards of quality control in blending, product testing and encapsulation. 1-2 before breakfast, 2 before dinner. This approach is typically effective for arthritis, lower back ache and joint pain. Some conditions may require higher dosages and referral to the scientific literature would be advised. Studies have shown that dosages as high as 12g of curcumin per day are well tolerated. Can I claim it from my medical aid? Yes. CurcumaGen has a NAPPI code, which enables General Practitioners to prescribe the product, and any user of CurcumaGen to claim the cost from their medical aid. CurcumaGen is registered with the SA MCC as a Complimentary Medicine. There is growing evidence that inflammation plays a critical role in chronic disease. Nuclear Factor kappa-B (NF-κB), the body’s master inflammation switch, is linked to a wide range of diseases. NF-κB, is found in the cytoplasm of the cell. In the presence of free radicals, pollutants, viruses, bacteria etc, NF-κB moves into the nucleus to activate inflammation and protective responses. Inflammatory responses, acute or chronic, include the release of enzymes (for e.g. COX-2), cytokines, leukotrienes, histamines, etc. Curcumin 'down' regulates inflammatory responses and 'up' regulates the cells protective and anti-oxidant responses. 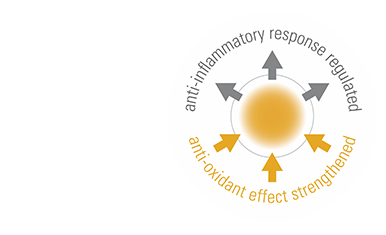 Curcumin’s broad effectiveness is a direct result of its unique ability to interact with up to 300 biochemical pathways in the body. Another key feature is the fact that inhibition of NF-κB, COX-2, LOX etc. does not impact COX-1, thereby not impacting the stomach’s mucus lining. Curcumin is also an antioxidant, up to 8x more effective than Vitamin E. So-called free radicals cause damage to the body in numerous ways and curcumin protects the body by mopping up free radicals. The literature on Curcumin is extensive. Below are a few easy reading articles. Click on the field of interest to access detailed scientific research and general articles on Curcumin's roles, effectiveness, mechanisms, and other studies. Slowing ageing and postponing the onset of age-related diseases may be achieved by blocking the NF-kappaB-dependent inflammation. NF-kB in Aging and Disease. The study results demonstrated that sulfite-exposure was associated with impaired learning and memory in rats. Adding curcumin to the rat nutrition plays a protective role in learning and memory after exposure to sulfite. We review the literature pertaining to these various classes of nutraceutical antioxidants and discuss their potential therapeutic value in neurodegenerative diseases. Multiple antidepressant potential modes of action of curcumin: a review of its anti-inflammatory, monoaminergic, antioxidant, immune-: modulating and neuroprotective effects; With increasing interest in natural treatments for depression, and efforts to enhance current treatment outcomes, curcumin is presented as a promising novel, adjunctive or stand-alone natural antidepressant. This review will provide brief perspective on some of the current research conducted in this area for better understanding of the ROS actions in various conditions of health and disease. Curcumin has been shown to be as effective as non-steroidal anti-inflammatories, without the side effects. NF-kB and its relevance to arthritis and inflammation; The importance of NF-kappaB in inflammation is undisputed and inhibition of the pathway is widely believed to have great potential as a therapeutic target in RA. Curcumin Inhibits Prostate Cancer Metastasis in vivo by Targeting the Inflammatory Cytokines CXCL1 and -2; In conclusion, chronic inflammation can induce a metastasis prone phenotype in prostate cancer cells by maintaining a positive pro-inflammatory and pro-metastatic feed-back loop between NFκB and CXCL1/-2. Curcumin disrupts this feed-back loop by the inhibition of NFκB signalling leading to reduced metastasis formation in vivo. Recent data suggest that an additional mechanism involved in cancer-related inflammation (CRI) is induction of genetic instability by inflammatory mediators, leading to accumulation of random genetic alterations in cancer cells. Long term use of curcumin in two smouldering multiple myeloma patients; Both patients showed continued improvement in a number of markers of disease activity including serum free light chains, paraprotein and % plasma cells in the bone marrow. These results suggest that patients with smouldering myeloma may benefit from daily ingestion of curcumin and long term use does not result in toxicity. This article reviews the use of curcumin for the chemoprevention and treatment of various diseases. Curcumin may match exercise for heart health benefits. Some studies demonstrate that curcumin reduced total cholesterol level and LDL cholesterol levels. The administration of low-dose curcumin showed a trend of reduction in total cholesterol level and LDL cholesterol level in ACS patients over one year. Our findings suggest that inhibition of SR-A-mediated oxLDL uptake and promotion of ABCA1-dependent cholesterol efflux are two crucial events in suppression of cholesterol accumulation by curcumin in the transformation of macrophage foam cells. Curcumin regulates the master molecule for inflammation. In mouse models, inhibition of NF-kB leads to delayed onset of age-related symptoms and pathologies. In addition, NF-kB activation is linked with many of the known lifespan regulators including insulin/IGF-1, FOXO, SIRT, mTOR, and DNA damage. Thus NF-kB represents a possible therapeutic target for extending mammalian healthspan. Curcumin improves results when used in conjunction with conventional medication. Curcumin for Inflammatory Bowel Disease: A Review of Human Studies; Although two small studies have shown promising results, all authors conclude that larger-scale, double-blind trials need to be conducted to establish a role for curcumin in the treatment of ulcerative colitis. 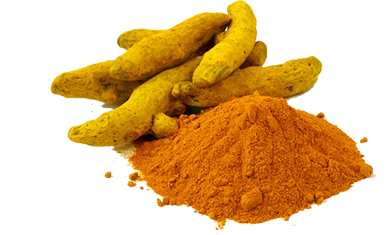 In addition to improving results when used in conjunction with conventional medications for UC, curcumin may pose a less-expensive alternative. Various pharmacological aspects of curcumin in vitro and in vivo are discussed in detail here. Curcumin: From ancient medicine to current clinical trials; Curcumin exhibits great promise as a therapeutic agent, and is currently in human clinical trials for a variety of conditions, including multiple myeloma, pancreatic cancer, myelodysplastic syndromes, colon cancer, psoriasis and Alzheimer's disease. Therapeutic potential of curcumin in medicinal chemistry; The present review has been devoted towards better understanding of the phytonutraceutic properties of curcumin and turmeric based on their disease specific indications and enhancing their prophylactic and therapeutic nutraceutical qualities. The article deals with the biological activity, mode of action, toxicity and forthcoming application of these leads. Curcumin and Its Emerging Role in Pain Modulation and Pain Management; Clearly, curcumin has significant anti-nociceptive properties. Further large scale studies are needed in humans to fully elaborate and harness the pain mitigating effects of curcumin. Recent clinical trials pertaining to the use of curcumin in skin diseases establishes its benefits and also the need for additional clinical trials in other diseases are discussed. These studies suggest the beneficial effects of curcumin and the potential of this compound to be developed as a potent nontoxic agent for treating skin diseases. The product and website do not intend to diagnose, treat, cure or prevent disease. The information provided is for informational purposes only. You should consult with a healthcare professional before starting any diet, exercise or supplementation programme.